photo of Liev will win our enduring gratitude! David Michalek, a photographer and visual artist, grins before the 60-foot-tall head of a very angry, very slow-moving Alan Rickman, who is projected onto a gigantic screen on the façade of the David H. Koch Theater at New York's Lincoln Center on Tuesday night. 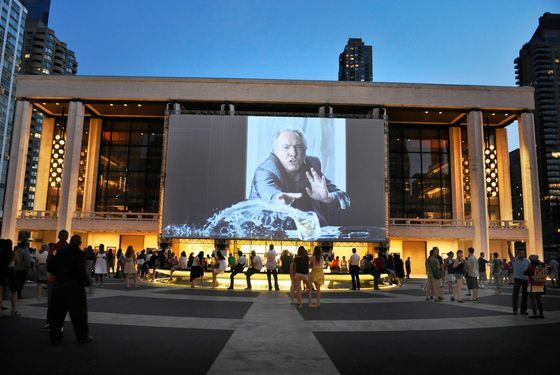 It’s part of “Portraits in Dramatic Time,” a series of ultra-slow-motion video portraits of Rickman, William H. Macy, Holly Hunter, Liev Schreiber, and other actors livening up the plaza every night from 8:45 to 11:45 until the end of the month. The 45 portraits on view feature original scenes that took only ten seconds to make but are stretched to as long as ten minutes in length.To create the appearance of glacially slow movement, Michalek used an ultra-high-speed digital camera, recording at anywhere from 500 to 900 frames per second but playing them back at the usual 30. Four years ago, Michalek used a prototype of a high-speed camera to realize his first slo-mo experiment: “Slow Dancing,” a similar installation focused on dancers and also shown on the Koch Theater’s façade. Working with actors for “Portraits” presented a different set of challenges. “Dancers kind of … dance themselves?” Michalek says (he knows: His wife is New York City Ballet principal Wendy Whelan). And the crowd on the plaza this muggy evening responds, transfixed. Take the next film up, one of two featuring Lili Taylor. It co-stars her young daughter, Maeve. Both are gazing at a newborn baby (the production designer’s): Taylor’s face is one of complete wonderment, but as her daughter shifts her gaze from the baby to mom, well, something else is going on. I heard about this! I'm hoping to visit my friends in Long Island before the end of the month, and if that happens, I'll try and make a trip to the city! I really wanna see what Liev's mini movie is. Is there any information on his segment? Oh, I've seen all the articles on this for a few weeks, but yet no pictures of Liev's captures. I would be interested to see Alan Rickman's too! AWESOME find Bettielee - Danke! That's so great! So, what do you guys think? Wondering what the gooky black stuff on his fingers is - or do I want to know? I wonder what the deal is with the suits staring behind him??? Sofia, you've got to go video tape it for us, mama!!! Seph, I thought of you as soon as I saw it - why could it not ahve been in Fall when you'll be there. I had no idea you were an Alan fan, my sister LOVES him and has met him before in Toronto. Did you see he's going to be on Broadway again this fall? will it be when you're there? Ooo!! Brill! I hope the dates cover when I'm there!!! !